Just a few days after I posted a link to the Zombie Foot toy, I stopped into my local drugstore to grab a few things. I suppose it’s because Halloween was last week, but I was pretty darn shocked to see the Zombie Foot hanging on a display in the middle of the store. $9.99 is typically more than I’d pay for a small squeaky toy, but being that I love zombies and had just written about how Teton needed this toy, I couldn’t not get it. Honestly, I didn’t think he’d even play with it because he isn’t usually into rubber squeaky toys, but he loves this thing. His obsession with socks has only increased the fun factor of the Zombie Foot – when he seems bored I just slap a sock over it and BAM! it’s like a brand new toy. 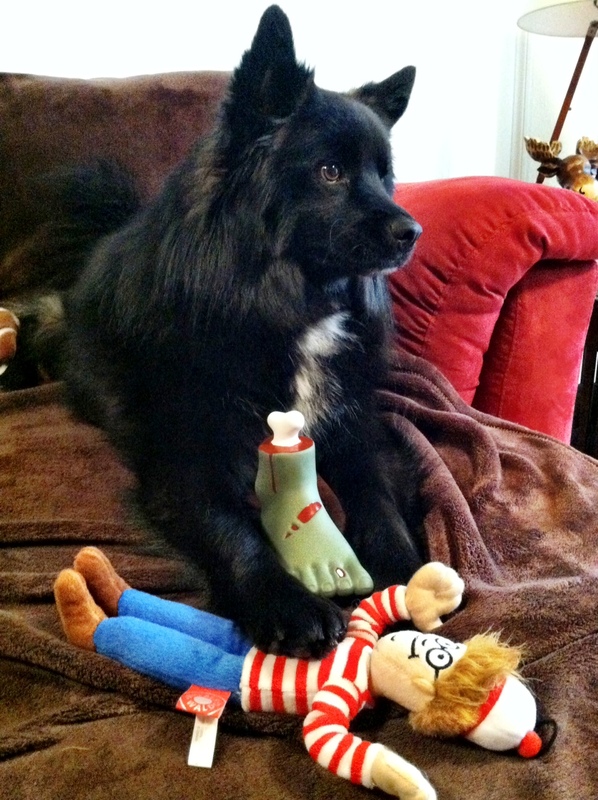 In addition to his Zombie Foot, Teton got a present from one of his aunties this weekend. Yes, Where’s Waldo has joined our home and is quickly becoming a favorite. How about your dog? What’s his/her favorite toy? Posted on November 6, 2012 by Shannon	This entry was posted in Toy Chest. Bookmark the permalink. ← Insurance Coverage: Does Breed Matter? Ha, great picture! Our dogs all love nylabones, but for toys the oldest pup loooooves anything that sings. So she usually has holiday toys year round since it’s easiest to find the ones that sing Chistmas carols. Too funny! Teton has a reindeer that sings a Christmas tune, as well. He loves it! Awhile back, when I was running my family home day care I had a male schnauzer pup named Tito. His favorite toy to retrieve was a kids’ toy bucket. We’d toss it and he’d grab it on the fly or on the bounce. Sometimes he’d come down to earth with it over his head…I have a pix! So Tito notices that the children like to play with buckets, too. In fact, he invented a game…he’d snitch someone’s bucket that was sitting next to them on the ground and off he’d prance with it. letting them ALMOST touch it and ZIP off he’d trot again. We called him “Bucket Dog”. He was the dog I lost to melamine tainted Rx dog food. Tito was quite a game-loving, fun dog! Frankie loves the Kong Wubba Friend toy (especially if it is the bear one). His first one had the ear chewed off of it by my roommate’s dog, and we started calling the bear, “Vincent” for Vincent Van Gogh. He’s now had a succession of “Vincents” over the last 2 years. Frankie will grab “Vincent” when he is asked. And he remembers to go look in the dryer for Vincent when he has to be washed. He will often sit around and make Vincent squeak, or else try to get someone to play fetch with him with the Vincent toy. This is definitely his favorite toy!! Oh, my gosh! I love that he waits by the dryer for Vincent after he’s been washed! You have a lovely doggy blog!